There have been several reviews of the new Watch that have been very critical of the device’s battery life when using LTE. I think that the expectations of some users may be a little unrealistic, based on that. I know we have to test thoroughly when reviewing, but we have to keep a realistic perspective, as well. Heavy LTE use will burn through a larger smartphone battery like nobody’s business, and the Watch doesn’t have a battery anywhere near that class. Direct cellular connectivity is meant as a backup, and for moderate to occasional use without the phone. It’s designed for situations like going for a run, working out, or like I did this morning- going to the store and local Farmer’s Market without your phone. If it can hold up to them, then the battery life will be acceptable. As for my use today, I’m actually pleasantly surprised. I have had my Watch connected to LTE for most of the last 4 hours. The battery was at 100% right off the charger when I started the morning, and I am still at 91% right now (By the time I finished the article over two hours later, I was at 79% after some more intensive testing). That tells me that the idle battery life on LTE is actually pretty good. Consider that I’ve only had one brief phone call, sent a few Messages, used Siri a couple of times, and have used my Weather and Reminders apps a bit, so my use was sporadic to this point. However, this is closer to my typical use pattern for the Watch than the more intensive testing I was doing yesterday. Now, this is only one area of battery life testing, so great performance here will only get users so far. Still, it is worth noting. The WiFi bug in watchOS that is causing some users issues with connectivity hasn’t bitten me yet, but that doesn’t mean I doubt its existence or am downplaying its severity. There is no doubt that not catching and addressing this situation before release reflects poorly on Apple’s team in charge of the device. I have actually tried to get my Watch to fall into this trap, but have been unsuccessful so far. 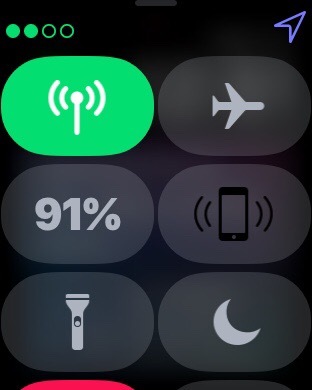 Any time I have either turned my iPhone off or put it in Airplane Mode, the Watch has immediately gone to LTE, even though I have known working WiFi networks on my phone both at home and at my Dad’s house. The bug shouldn’t affect me if the WiFi network is working and the key is correctly entered on my phone. However, if my Watch won’t connect to WiFi at all, I may not be able to reproduce these results if I go to a place like Starbucks. If I can get my Watch to connect to such a network that restricts access with an “Accept” button for Terms of Service or similar, I will let you know. LTE speed has been a very pleasant surprise, so far. The only issue is that not all apps support direct connectivity. For example, the Google News, Twitter, Twitteriffic, Facebook Messenger, Instagram, Yelp, Trello, Dashlane, Outlook, and Starbucks apps all currently require a connection to the Watch to function. They won’t be capable of pulling data down from a direct Internet connection until their developers update them. Some of the third party apps I tried that worked successfully were Flipboard, ESPN, The Score, CBS Sports, The Weather Channel, Weather Live, Timeline, Around Me, and Saviry. Also, all of Apple’s apps obviously work with the local connection, along with many of Siri’s assigned tasks, as well. One thing you will notice is that the speed of data delivery to apps picks up several notches when using LTE. More notable is the consistency of the speed (assuming a good cell connection, of course). Most of these apps and searches happen in five seconds or less, every time you run them. Using the connection between the Watch and iPhone, you might have similar speed sometimes, but get left with the rotating wait symbol almost as often. The unfortunate thing is that LTE doesn’t come into play that often on this device, unless you force it. The way that the Watch is designed, it won’t engage unless it HAS to, and that’s fine for now. Battery life is a concern, and Apple has to design around that constraint. However, for apps (not sloppy phone app conversions, but the right kind for use on the small screen) to become viable on the Watch, the connection experience has to better, and consistently so. Allowing developers to force a direct Internet connection for their apps would be a great step in the future to improve the speed and smoothness of operation. This version of the Watch gives you a glimpse of the future promise of this device, and it is bright. I will talk more about this later, but I am happy with not only the new Sport Loop that I touched on yesterday, but also the Woven Nylon bands that I picked up when I ordered my Watches. 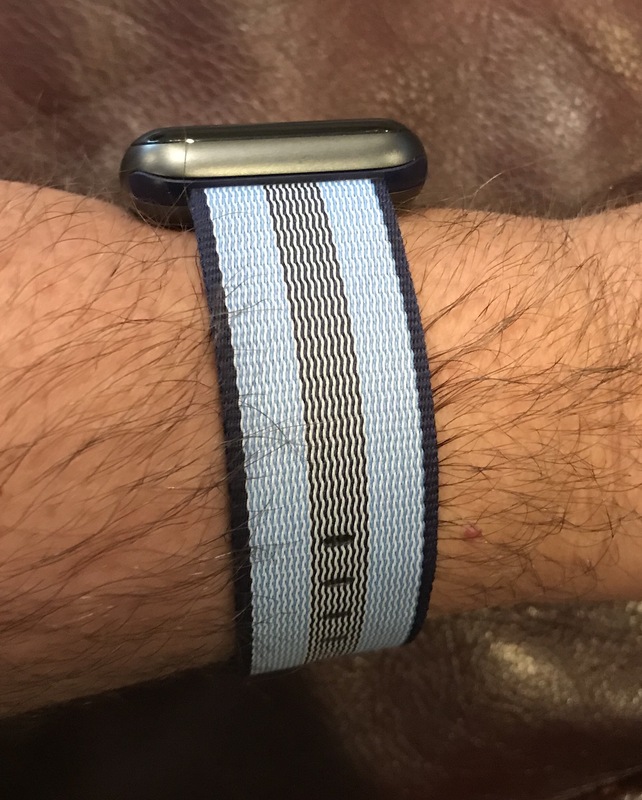 I got the Midnight Blue Stripe and White Check Woven Nylon Bands, and I am pleased with both to different degrees. 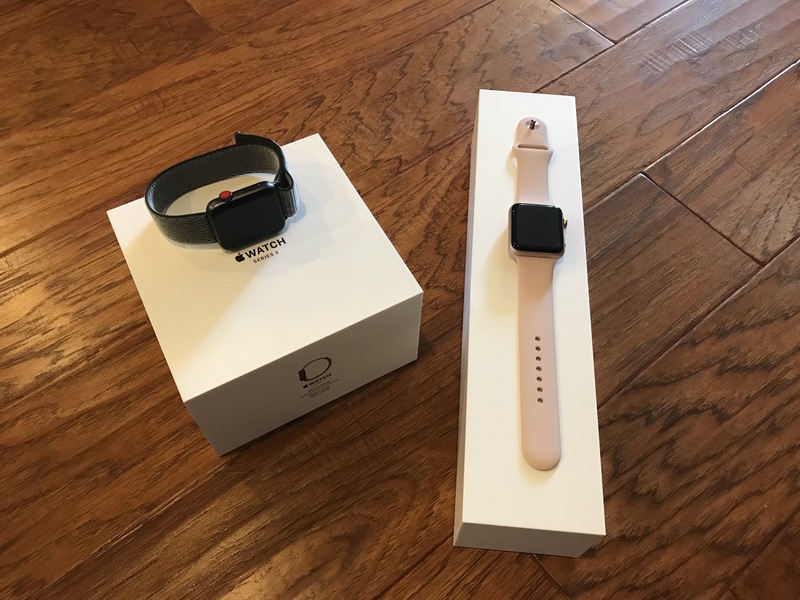 I like the White Check band with the Space Gray Sport Watch. Maybe not love, but definitely like. I didn’t think much of it with my Series 1 in Gold, and was prepared to return it right after I got it (it arrived a few days before the new Series 3). However, I think it looks much better with the Space Gray Watch I’m sticking with. I really love the Midnight Blue Woven Nylon band. It doesn’t hurt that I am a huge Memphis Grizzlies fan and this band is a dead ringer for their colors. Beyond that, however, I think it looks good with both my Series 1 Gold or the Series 3 Space Gray. If you like the color blue, you will like this band. While the feel of the Woven Nylon is a bit more rough to the touch than the Sport Bands or the Sport Loop, it is still quite flexible and comfortable. They also feel very solid and durable, and add color combinations that aren’t possible with the Sport Bands. I also like the fact that they also add more options for those of us who aren’t dropping $100 and up for Apple’s own bands. I’ll pay Apple’s price for these, but I’ll stick with the knockoff Milanese Loops, thank you very much. That’s all for now. I have football to watch and burgers and dogs to grill today. As always, if you have any questions or anything to add, you can hit me up in the Comments section below, on Flipboard, on our Facebook page, or on Twitter @iPadInsightBlog.